Prostate Cancer & Beyond: It's been a while since I posted. As you might have noticed I am not updating my blog as often as I did. My implant is everything I want it to be and I am living my life again. What it does mean however is that there is not too much to tell but you can bet I will keep posting and updating my blog. Like I have said all along I am more than happy to answer any questions you or your partner might have - you only have to ask. I am fine with messenger, skype, email, phone, in person or on here, whatever you prefer. Even better in my opinion if we are local-ish to each other I am more than happy to meet for a chat/coffee/beer or all three - again just give me a shout. I gave up on the sports car - 4x4 more comfortable. Cycling to keep fit was ok and with a different saddle it was comfortable enough. I just could not get back into it the way I was prior to my implant surgery. As for the tattoos - no more planned yet. Anyone with a Kayak want to join me? 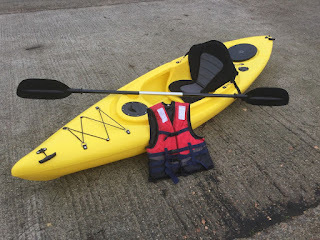 I live quite close the the sea and a few rivers however I think I'm a bit of a fair weather Kayaker so now all I need is a warm day and preferably warm water.